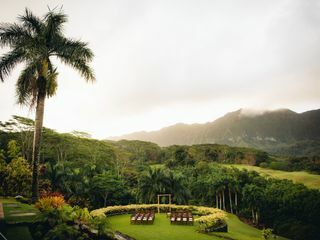 Nestled between Mount Olomana and the majestic Ko'olau Mountain range, the Royal Hawaiian Golf Club offers a lush paradise with Hawaii's most spectacular views. The property spans 1,100 amazing acres with statuesque trees, tropical foliage and running streams to create an idyllic scenery for stunning photo opportunities. 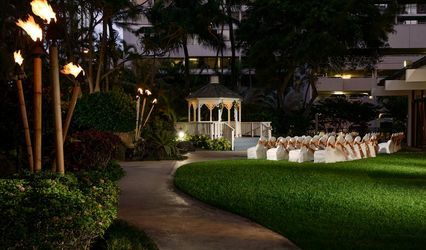 The Garden Lawn is perfect for outdoor wedding ceremonies and events. Imagine walking down the grand stairway then exchanging vows in front of your loved ones amidst the breathtaking mountain views. 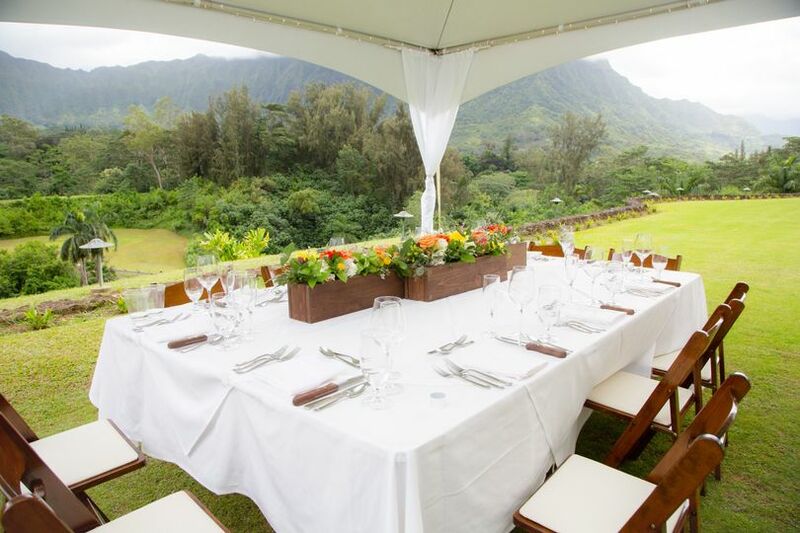 Opt for a tent to keep your reception outdoors or select the luxurious Ali'i Ballroom, where you can enjoy indoor comfort while savoring the panoramic landscape. 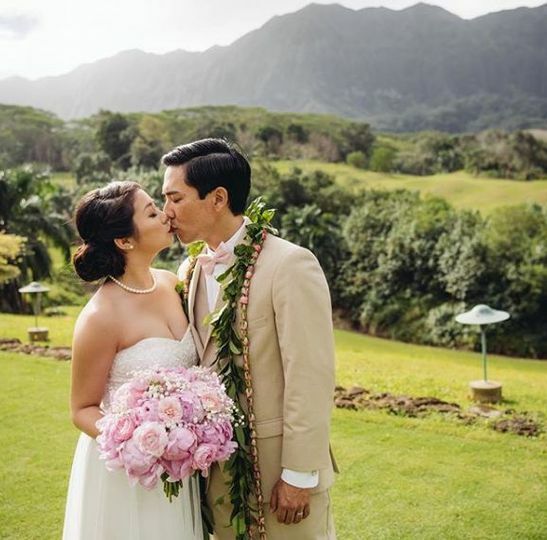 Couples who host their wedding at the Royal Hawaiian Golf Club receive complimentary day-of access to the Signature Hole for picture-taking with golf cart transportation. There is so much this hidden gem has to offer. 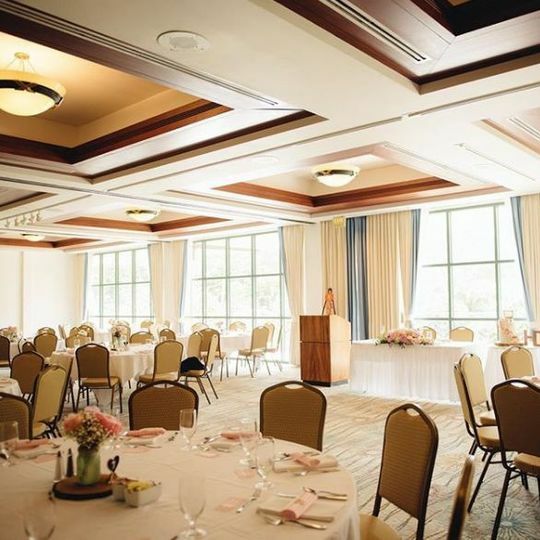 With an upscale yet affordable restaurant on site, The Olena is ideal for hosting smaller events, such as a bridal shower or rehearsal dinner. Select from the wide array of buffet options or work with the Executive Chef to create a uniquely customized menu. The professional staff can also help you to design personalized Signature Drinks for your guests. Savor the fresh desserts made in-house, chosen to best compliment your dining selections. 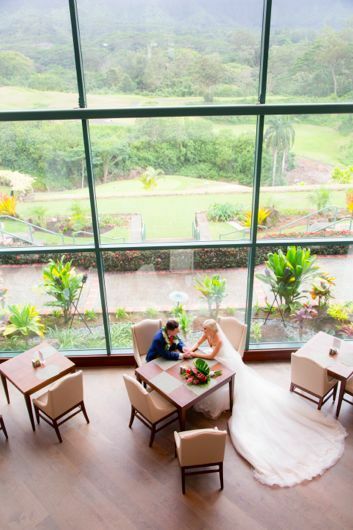 Besides the abundant free parking available on site and additional amenities to enhance your experience, the Royal Hawaiian Golf Club offers unparalleled service to bring your dream wedding to life. ***Perfect for events up to 200 guests. Please contact Chanel Castro (Event Specialist) for more information. 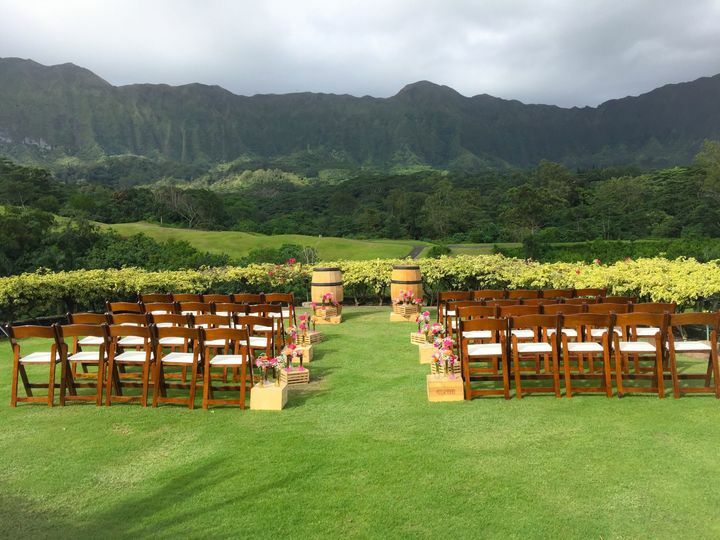 This review is for our absolutely beautiful wedding at the Royal Hawaiian Golf Club. First off, if you're looking for a stunning view, this place has it. I can't wait for our professional photos. We were going for the Jurassic Park feel with no buildings and great landscape and this place has it. 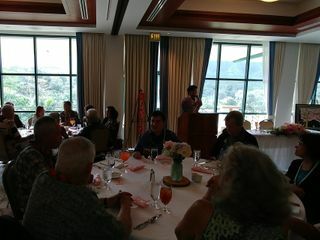 We shopped around and Royal Hawaiian GC had the better views and much better value than Ko'olau Ballrooms. The staff here is amazing. Merryl and Chanel have been so helpful and patient with us. I can't count the number of emails I have between us but they are always quick to respond and a question is never stupid. The wedding went surprisingly smooth even though there was heavy rain the morning. We had backups were in place but luckily they were not needed. Got all our photos in, guests absolutely loved the views (people were taking so many photos) and moreover loved the food. Garlic chicken, mac nut crusted mahi mahi, and kalbi were the main entrees but the surprising hit was the mashed potatoes. Little chunky with butter and suffice it to say it was a big hit. Guests went back for seconds and even thirds on the food. We were told by friends we need to eat during the reception and the staff was very attentive and brought out pupu when they could squeeze between table photos and were very quick to bring out our main plates when we were finished. We talked to many of the guests and they all raved about the food, view, and beautiful wedding. They really provided the awesome experience for our guests that we were looking for. However, I can't rave enough about the staff that worked with us. They were never too busy or overlooked anything. They have many options and will work with you to get the best out of your day. Contact them and I sincerely hope you get to experience what we did. These amateur photos give you an idea, but I hope to get the prof photos soon to show just how breathtaking it is! Chanel Castro (Event Specialist) has been awesome so far! This is a destination wedding for my fiance and I, and she did a wonderful job going over the details over the phone and email. 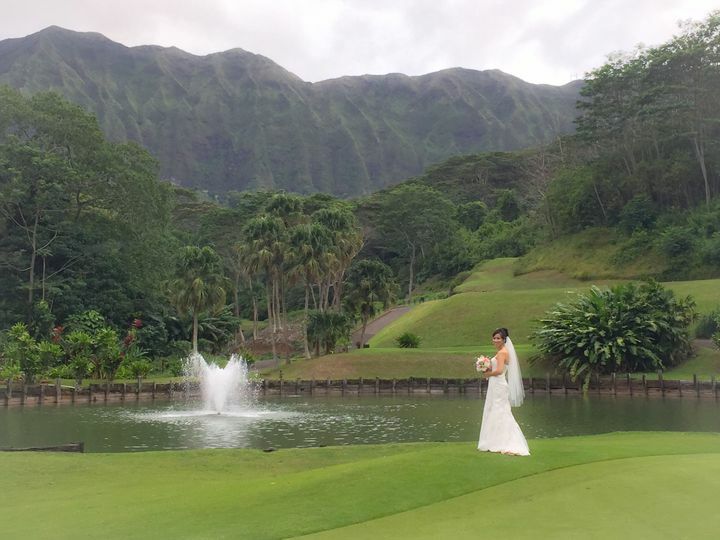 We did meet with her in person for the tasting menu and to visit the site, and she is definitely a subject matter expert for all wedding details at the Royal Hawaiian Golf Course. I highly recommend this venue for your reception! Great time at Royal Hawaiian Golf Club! This review is coming pretty late, but we're still very excited to tell you about the great time we had with the Royal Hawaiian Golf Club! 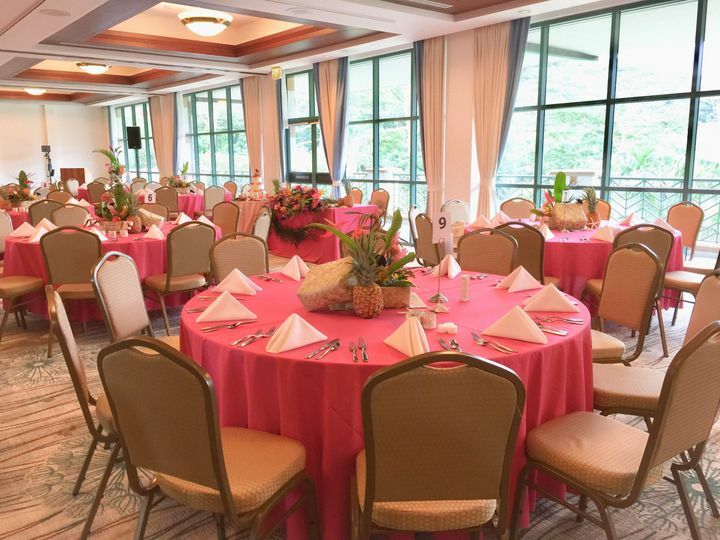 The Royal Hawaiian Golf Club is a beautiful venue, and they will take good care of you and your guests. However, clients must be vigilant and proactive to make sure they get what they want. 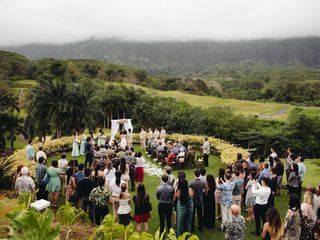 When my partner went looking for venues in O’ahu, I insisted that we not be married in Waikiki, and that our wedding be in front of the mountains. 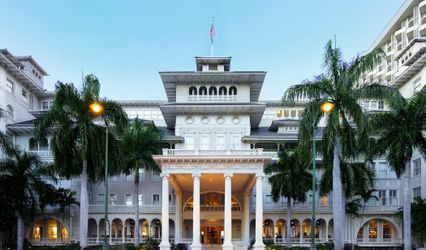 In that, and in so much more, the Royal Hawaiian Golf Club succeeded. 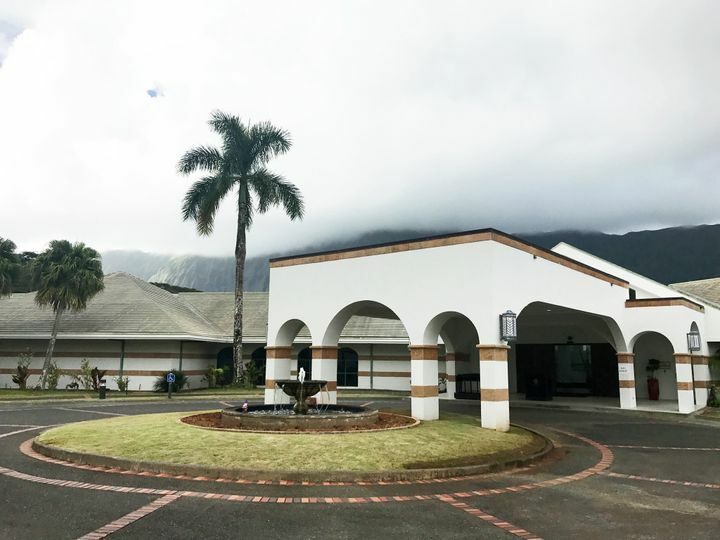 Nestled in the Ko’olau Mountains just outside of Kailua town, the Royal Hawaiian Golf Club is a fabulous golf course, restaurant, and banquet space that is trying to do more private events and weddings. Unfortunately, this expansion into weddings has left their team a bit short-staffed and overwhelmed. The venue director for weddings was awfully sweet, but was very difficult to reach with questions. She was rarely at her desk, had terrible cell reception in the mountains, and rarely responded to emails. Worse, we found we had to correct her on the details of our wedding (including the spelling of my name) multiple times. We put up with this because the venue was so great, but we knew that we and our coordinator were going to have to stay on top of the venue staff to ensure that everything on the day was going to be executed as planned. And, barring a minor mishap with the bar (serving liquor when we specifically requested beer & wine only - rectified and refunded when we brought it up), everything did go smoothly. 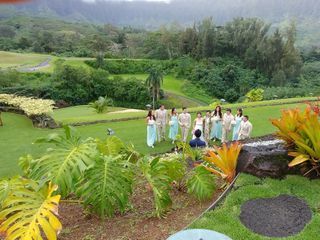 Aside from the stunning view, the best part about the Royal Hawaiian Golf Club is that they do their own catering, and the food is DELICIOUS. No rubber chicken here. We had kalua pork and furikake salmon for our entrees, along with an assortment of local sides and salads (chicken long rice ftw). I was surprised at how many salads they offered in their catering menu, but for all I know, most weddings have five different salads. In any case, the RHGC team was very accommodating, and worked with us to adjust the menu to our needs. We had to remind them about our menu selections a few times, but the food turned out great. 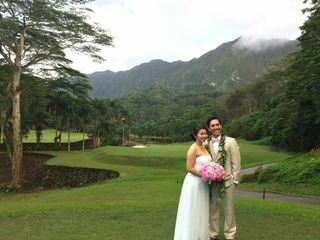 In the end, I’m so glad my partner and I were married at the Royal Hawaiian Golf Club. The food and the location were fantastic, and everyone had a great time in the mountains. If we could do it again, we would. 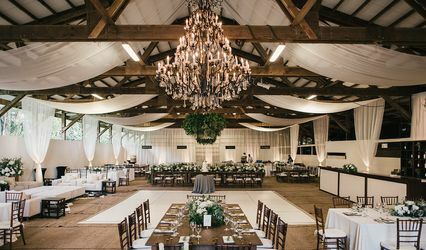 However, I would caution anyone planning a wedding at this fabulous venue to double and triple check that they have all the details right, at least until they get enough staff to handle the amount of weddings they are planning. When you do get married at RHGC, get ready for some spectacular photos, and incredible food!